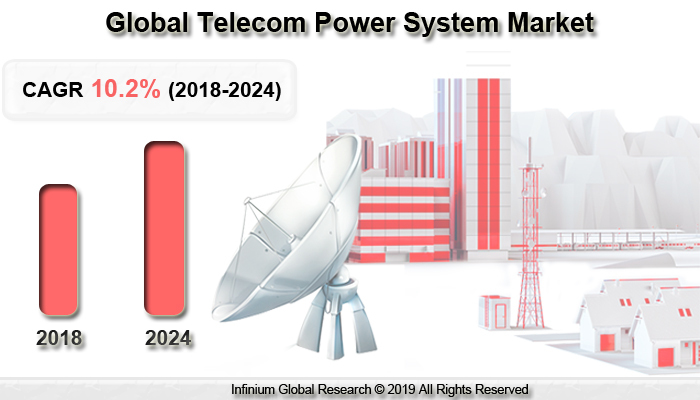 A recent report published by Infinium Global Research on telecom power system market provides in-depth analysis of segments and sub-segments in the global as well as regional telecom power system market. The study also highlights the impact of drivers, restraints, and macro indicators on the global and regional telecom power system market over the short term as well as long term. The report is a comprehensive presentation of trends, forecast and dollar values of global telecom power system market. According to the report, the global telecom power system market is projected to grow at a CAGR of 10.2% over the forecast period of 2018-2024. Telecom power systems are used to support telecommunication services by controlling and monitoring the flow of power over telecom networks. Telecom power systems are specifically designed for internet support, data centers, wireless broadband access, and fixed-line applications. These systems are used for efficiently storing energy on batteries when there is no AC supply. Today, renewable energy sources such as solar and wind are also being used to supply power to telecom towers. The benefits offered by telecom power system market are effectively eliminating batteries, diesel generator, and automatic transfer switch. Increasing adoption of hybrid power systems and expansion in telecom infrastructure are driving the growth of the telecom power systems market. The considerable use of the mobile device in urban areas has improved the integration of femtocells and Pico cells which need DC power systems. This increasing adoption of hybrid power systems is augmenting the growth of the telecom power systems market. The strong growth of the telecom power systems is in the developing regions such as the Asia Pacific. The rising number of subscribers in such regions along with the installation of the telecom towers are strengthening the market growth. Moreover, the increased deployment for the small cell power system for LTE (Long term evolution) is creating a positive impact for the market to grow. Moreover, strict carbon emission regulations and high operating cost are likely to hamper the growth of the telecom power system market. Furthermore, government initiatives to stimulate green telecom power solutions and solar photovoltaic in multiple source-based systems are anticipated to create several growth opportunities for the key players in the telecom power system market over the years to come. Among the geographies, Asia Pacific dominated the telecom power system market. The growth in the Asia Pacific region is due to the high penetration rate of telecom towers in rural areas in order to broaden the mobile connectivity. Moreover, In China, 4G-LTE penetration drives the demand of telecom-power-system market in the Asia Pacific region. Asia-Pacific predominantly comprises two of the fastest-growing countries such as India and China. Europe is expected to hold the dominant market share and is likely to continue so over the forecast period. The report on global telecom power system market covers segments such as component, and power source. On the basis of component, the sub-markets include converter, heat management system, controller, generator, circuit breakers, and distribution unit. On the basis of power source, the sub-markets include diesel-battery, diesel-wind, and others. The report provides profiles of the companies in the market such as Alpha Technologies, Huawei Technologies Co., Ltd., ABB Ltd, Eaton, Delta Electronics Inc., ZTE Corporation, AEG Power Solutions, Beijing Dynamic Power Co., Ltd., and Vertiv Co. The report provides deep insights into the demand forecasts, market trends, and micro and macro indicators. In addition, this report provides insights into the factors that are driving and restraining the growth in this market. Moreover, The IGR-Growth Matrix analysis given in the report brings an insight into the investment areas that existing or new market players can consider. The report provides insights into the market using analytical tools such as Porter's five forces analysis and DRO analysis of telecom power system market. Moreover, the study highlights current market trends and provides forecast from 2018-2024. We also have highlighted future trends in the market that will affect the demand during the forecast period. Moreover, the competitive analysis given in each regional market brings an insight into the market share of the leading players.